Create and print unlimited number of attractive, personalized newspapers that reveal interesting information about the year you were born, or any date between January 1st 1900 and December 31st 2015. It's easy to create colorful Santa letters for the young ones. Choose from 8 designs, and 6 different letters, or create your own. Print them out, or email them. Free upgrades for life. Keep a personal daily journal. Simple and easy to use. Store an unlimited number of entries, with up to 4 pictures for each day. Easily search, browse or print entries. Password protect your thoughts. Your medical information is important. Most people have bits of this information scattered here and there. MediBase Pro makes it easy to compile all this data into one place, available whenever you need it. HD Organizers organize, track, and manage any data related to your business, home, or organization. Free lifetime upgrades. Excellent free email tech support. Making shopping lists is fast, easy and fun with Speedo Shopper. Generate multiple lists and save for later use, or print it out to take to the store. Send yourself a reminder email or even email your grocery list! Free upgrades for life. Create and compile great full featured Windows Software, presentations, e-books, e-zines, catalogs and much more! Extremely easy to use. Order here to save 10% off the retail price. Take control of which search engines index your site. Allows you to easily create or modify robots.txt files to control what the searchbots can and can't index on your web site. If you're an RV'er, you'll love having RV Companion along. Whether you just need to find a camp (over 13,000 included) or keep a complete record of your journey, RV Companion is there. 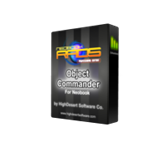 Developed specifically for NeoBook developers, and coded entirely with NeoBook, NeoBook Object Commander stores unlimited NeoBook objects with object properties and actions to use again in other projects. Site Design by NetImages Design Co.